Sony looks to improve on its Tablet S that was released last year with the Xperia Tablet S. This one features a quad-core Tegra 3 processor, slimmer design. Still has a slight curved feature to it. One thing about Sony, there design team is on point and thats one thing I love about that company. It has some nice TV features this time around, and the big edition is the Xperia addition. Which was used for their mobile phone line before. Check the presser below for more information. Sony announced today the launch of the Xperia Tablet S, a thin and light device packed with original applications and Sony exclusive features. The new device joins Sony’s smartphones under the Xperia sub-brand. The Xperia brand delivers mobile experiences that enhance user enjoyment through design and network services. By introducing a tablet under the Xperia brand, Sony offers users a consistent experience between the immediate convenience of an Xperia Smartphone and an immersive entertainment experience of an Xperia Tablet. Common user experience across the devices further enhances overall usability and intuitiveness. Combining optimally designed hardware and software, Xperia Tablet provides consumers with a compelling way to play, watch, listen, share, discover and connect. Building on the popularity of the universal remote control feature in the previous model, the Xperia Tablet S has enhanced this feature by adding macro functionality, allowing the ability to turn on multiple devices of most brands, including TV, Blu-ray Disc™ player and audio system, with the touch of one button. Consumers can easily program sequenced commands such as “Watch TV” or Play Music” and perform the sequences with one tap on the screen. To further enhance the living room experience, Sony will offer a new app called Watch Now, which enriches the TV watching experience. Watch Now provides an interactive, visual program guide fueled by personal preference and real-time trends from users’ social media feeds. TV fans can use the app to discover new shows based on intelligent recommendations from the app, change the channel with a flick of the finger and share their thoughts on what they are watching via Twitter™, Facebook® and Get Glue. 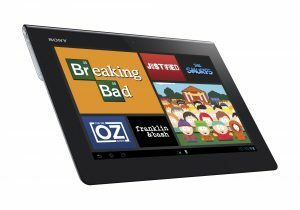 The Sony exclusive app will be available for download for the Xperia Tablet S in the US from Google Play™ at launch. Not only will Xperia Tablet S owners be able to control their living room, but they can also control content on the device for various other people using Sony’s new exclusive Guest Mode feature. Guest Mode allows for personalized configurations for different users by displaying different wallpaper, applications and widgets. The tablet owner can manage access for any friend or family member by regulating which apps and widgets are accessible by others. Guest Mode can provide parents with a strong parental control tool by offering more supervision over what content their children can consume. “Tablets are no longer just a personal device, but are being shared by family members, and we heard from consumers that they wanted to have parental controls. It was important for us to provide parents with a solution for controlling what content their children could access from the tablet,” Lubell added. Xperia Tablet’s splash proof design helps provide assurance that the tablet is protected from the elements. With an IPX-4 splash proof rating, the Xperia Tablet S can withstand splashing water at all angles when the multi-port cover is in place. Even with wet hands the LCD screen will still recognize touch gestures, making the device a perfect companion in the kitchen and beyond. · Purchase or rent on-demand hit movies and TV shows anytime you want with Video Unlimited. · Discover and listen to millions of songs from all your favorite artists with a Music Unlimited subscription, now with the ability to cache playlists for offline listening. · Store your photos and videos in the cloud and share on any device at any time with friends through PlayMemories Online™ service. Book lovers can also purchase and read their favorite eBooks with the pre-loaded Reader™ application and manage their bookshelf across multiple devices, including Sony Reader and Xperia Smartphones. This fall, Sony Xperia Tablet S owners will also be able to enjoy dedicated content from PlayStation®Mobile on their tablets. Small Apps allow tablet owners to truly multi-task by using a minimized version of the browser, calculator, remote control, recorder, timer, memo or clip simultaneously while using another application. Any widgets downloaded to the device can also be added to the Small Apps. Scrapbook, a new app available at launch, allows users to clip from websites, services or apps to create their own scrapbooks. Users can then share clips or scrapbooks as images across multiple apps. Users can download Socialife, a fun, stylish viewer to manage your social networking sites and news feeds in one place. Lastly, Sony offers three media applications, WALKMAN®, Album and Movies, allowing users to consume their content in feature rich and easy-to-use apps. The Xperia Tablet S, which launches with Android 4.0, has a thin and light aluminum body while still maintaining a unique design for a comfortable grip and feel. It is fast and powerful with a NVIDIA® Tegra™ 3 quad-core processor. The screen maintains a crisp display and fingerprint and glare reducing coatings. The device includes a full-sized SD card slot for expanded storage and HDMI® connectivity with optional HDMI adapter cable. With built-in Wi-Fi® compatibility, users can browse the internet, check e-mail and access digital content anywhere there is a Wi-Fi connection. Sound quality is enhanced with ClearAudio+ mode. ClearAudio+ mode, developed with Sony’s own signal processing technologies, allows users to effortlessly enjoy audio quality that is distinctly Sony. ClearAudio+ mode incorporates a variety of Sony’s technologies, but with one simple operation, users can easily enjoy Sony recommended sound in ultimate clarity and presence, across the entire spectrum of sound. Also available at launch is a promotion for up to $45 in feature films from Google Play™. The Xperia Tablet S will come equipped with redemption codes to add three movies from a choice of fifteen available movies to the Google Play movie library. Users can personalize their Xperia Tablet S with a new line of optimized accessories (sold separately). The Cover with Keyboard features a thin keyboard that connects via the device’s multi-port, so no pairing is needed. The Docking Stand is sleek, stylish and adds functionality with three USB ports and one HDMI port. Other accessories include a Simple Stand, Carrying Cover in seven stylish colors, a Charging Cradle and a Dock Speaker. The Xperia Tablet S is available in 16 GB, 32 GB and 64 GB versions and will be sold at Sony Stores, including online, and other authorized dealers nationwide for about $399, $499 and $599 respectively starting September 7 (preorders start today).